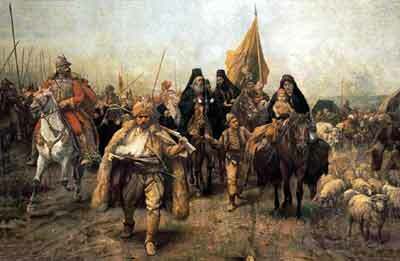 ``The Moving of the Serbs,'' portrays the Serbian Orthodox Patriarch Arsenije III Carnojevic, surrounded by soldiers, flocks of sheep and women with babies, leading some 36,000 families from his seat in Pec, Kosovo and Southern Serbia to what is now Vojvodina and further to Hungary in 1690, after Serbian revolts failed. The goal of this page is to offer written evidence on centuries old Serb presence in Kosovo and Metohia - the cradle of our culture and spirituality. We do not intend to underestimate the achievements of others but only to prove that eradication of the Serbian people and our culture in Kosovo is an attack on the overall European cultural heritage and tradition. History is a very important clue to understanding of the deep complexity of the Kosovo crisis although it may be a serious obstacle for future of Kosovo communities if it is not overcome by genuine development of democracy and civil society appropriate for the time in which we live..
Kosovo and Metohia, two central regions of perennial Serbia, are the very essence of Serbian spiritual, cultural identity and statehood since Middle Ages to date. Fertile and clement planes of Kosovo with mild climate, and reach in water resources, with high mountain chains bordering with Albania have been good-blessed environment for a fruitful development of the highest achievements in all fields in medieval Serbia. The cultural and demographic strength of the Serbs is best illustrated by the presence of 1.500 monuments of Serbian culture identified so far. Numerous outstanding noble Serbian families used to live in these regions, as families Brankovic, Hrebeljanovic, Music, Vojinovic, some of which were the inceptors of Serbian dynasties. A great number of noble castles existed all over Kosovo with rich aristocratic life going on inside their walls. 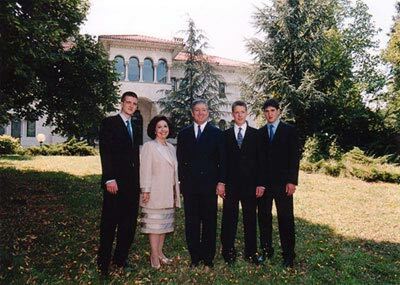 They were also meeting places of Serbian nobility and centers where important political and other decisions have been taken and places attended by foreign envoys and outstanding guests from noble foreign ruling families. Here are some of famous medieval castles: Svrcin, Pauni, Nerodimlja, Stimlje and many others. In Svrcin, for example, the famous Serbian Emperor Dusan was first crowned king in 1331, and Pauni, famous for its beauty, were favored place of king Milutin. 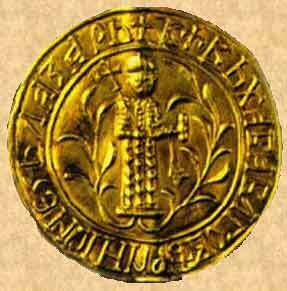 In Pauni in 1342 Serbian Emperor Dusan had received Jovan VI Kantakuzin, one of the pretenders to the Byzantine throne at that time. 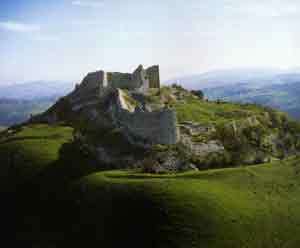 Nerodimlja, with the fortress of Petric over the castle, was favorite residence of Stevan Decanski.It is in the Stimlje castle that king Uros issued his charges. In Ribnik, near Prizren, were the castles of Serbian Emperors Dusan and Uros. The Serbian elite and minor nobility has built in these regions hundreds of smaller chapels and several dozens of monumental Christian monasteries. 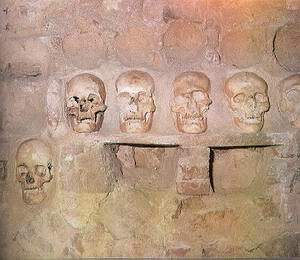 Some of them have been preserved to date, such as Patriarchy of Pec (since 1346 site of the Serbian Patriarch), Decani, Gracanica, Bogorodica Ljeviska, Banjska, Sveti Arhandjeli near Prizren and others. Serbian churches and monasteries had been for centuries owners of great complexes of fertile land. Metohia, the name originated from the Greek word metoh means church land. Highly developed economic life was an integral part of a high level of civilization attained in medieval Serbia. Prizren, for example, was a famous economic and commercial center, with developed silk production, fine crafts, and numerous settlements where the merchants from Kotor and Dubrovnik had their houses, and in 14 century, Prizren was the site of the consul from Dubrovnik for the whole Serbian State. And many other commercial centers such as Pristina, Pec, Hoca, Vucitrn, testify of the strength of highly developed economic life in these regions. Famous mining center were Trepca, Novo Brdo and Janjevo, out of which in the 15 century Novo Brdo had become one of the most important mining centers of the Balkans. Silver and gold were exported to the big European centers in great quantities. The Serbian society of the Middle Ages was in all respects identical to European social, economic and cultural developments of that time, much more integrated in Europe then it may seem when analyzed from the later perspective. Turkish invasion means a fatal turning point in Serbian history in the second half of the 15 century. As known from history, the advance of the Turks towards Europe was a rather slow process. 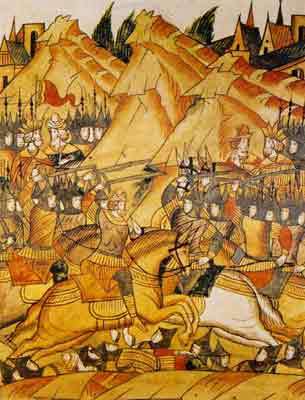 Prince Lazar Hrebeljanovic and Serbian nobility in the famous battle of Kosovo in 1389 did everything humanly possible to stop the Turkish invasion toward south eastern Europe. It was not only a clash of two armies led by their rulers Serbian prince Lazar and Turkish sultan Murat (who both perished in the battle of Kosovo), but also a clash of two civilizations, one Christian and European and other Islamic and Asiatic. Later on, in Serbian national conscience the battle of Kosovo has acquired mythical dimension of a crucial historical event, greatly affecting the consequence destiny of the whole Serbian nation. The Serbian epic poetry is very rich and the cycle of poems devoted to Kosovo are a pearl of that treasure and moral and psychological support to Serbian people during the centuries of forendous slavery under the Turks till the 19 century, and speaking of Kosovo and Metohia till 1912, when they were finally liberated from the Turks. This is the reason why in Serbian national poetry we find such a great number of representatives of Serbian nobility, of Serbian castles and outstanding Serbian monasteries from Kosovo and Metohia. Prizren, from example, in our national poetry is called the "Serbian Constantinople". All topics connected with Kosovo are symbols of a high medieval civilizational level of the Serbian society and culture, its aristocratic wealth and glamour on the one hand, and on the other the fall of that civilization due to the violent and cruel blow of the Ottoman invaders. The Turkish invasion of south eastern Europe and the Serbian lands as its part, have not only brought about the fall of Christian civilization, but are also responsible for the destruction of all social structures, the elimination of the Serbian elite and the destruction of the most outstanding cultural achievements. One part of Serbian nobility was killed, one part expelled to Asia, one part forced to take up Islam, and one part managed to emigrate north, west and across the Adriatic to Italy. Average people deprived from its leaders had no option but to stick to the traditional national values. It is thanks to the Orthodox Church which managed to revive its work in 1557 (renewal of the Patriarchy of Pec), that Serbian people kept alive the awareness of the medieval national state and high achievements of its civilization. Many medieval castles and towns were destroyed, many churches were raised to the ground , and some of them turn into the mosques. 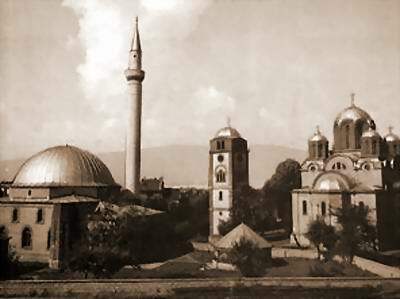 At the beginning of the 17 century, Sveti Arhandjeli (where emperor Dusan was buried), the monumental mausoleum of Emperor Dusan was totally destroyed, and the precious polished stone out of which the church was built was used for building the Sinan-pasa mosque, sill existing in Prizren to date. Bogorodica Ljeviska, the monumental legacy of King Milutin, in 1756 was turned into the mosque and only after the First World War it was again restored into a Christian church. Turkish invasion and the consequences of their conflict with Christian Europe, particularly since the siege of Wienna in 1683, had considerably changed the ethnic and demographic picture of that part of Serbia. The orthodox Serbs were the absolute majority population until the end of the 17 century, and before the First Migration of the Serbs in 1690, due to the defeat of the Christian Europe in the conflict with the Turks and the participation of the Serbs in that conflict of the side of Christian Europe.The Turks settled in towns, and the Albanians (at that time called Sqipetars) coming from the mountains of northern Albania of today started settling in smaller groups on Serbian land in bordering regions of Metohia. Until the 18th century, there are no Sqipetars* (now called Albanians) in Kosovo and Metohia in bigger agglomerations. Actually, they began settling in this region in greater numbers only in the 18th and 19th century from todays northern Albania. In addition to the newly settled Sqipetars (now called Albanians) who were mostly Muslims or converted to Islam soon after settling in Kosovo, it is also the islamization of the Serbs that brought about great changes in the cultural environment of this region. Many of islamized Serbs gradually fused with predominantly Albanian Moslems and adopted their culture and even language. At the beginning of the second half of the 19th century, the Turks also settled Cherkeses in this region. Despite of all these artificial demographic changes, Orthodox Serbs decreased for almost 50% of the total population living in Kosovo and Metohia. In the second half of the 19th and the beginning of the 20th century the Serbian middle class in Prizren, Pec, Pristina and other towns was the main driving force of the urban and economic development of the region . The news paper "Prizren" was published both in Serbian and Turkish language. 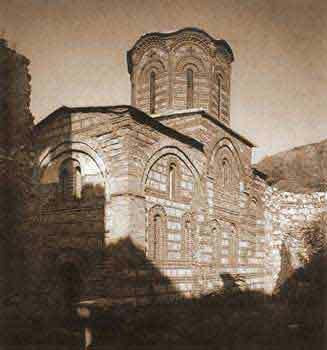 In 1871 the Orthodox Theological School was founded in Prizren by Sima Igumanov. During the eighties and nineties a great number of new schools, cultural institutions and banks were founded. It is during the Second World War, that the most drastic changes in the demographic picture of Kosovo took place. In Kosovo and Metohija the Albanian nationalists got free hand to terrorize the Serbs. Under such pressure estimated 75,000 Serbs left Kosovo. In their empty houses about the same number of Albanians from Albania settled. This definitelly tipped the ballance in the Albanian favour. The first official census in post-WWII Yugoslavia (in 1948) showed 199,961 Serbs and Montenegrins in Kosovo and 498,242. After the Second World War, As a result of unbelievable demographic explosion Albanian population in Kosovo doubled by 1971. The official Yugoslav census for that year shows 916,168 Albanians living in Kosovo, while Serb and Montenegrin population reached only to number 259,819. This demographic trend clearly demonstrates that the theory of Serb repression over Albanians after the WWII is absolutely not correct. The truth is that the Commnist authorities favorized the Albanians on the expense of Serbs allowing uncontrolled settlement of Albanian immingrants and tolerating different methods of ethnic discrimination over the Serbs which made more and more Serbs leave the province and seek better life in Central Serbia. By 1990ies more than 800 settlements in which Serbs lived with Albanians became ethnically clean Albanian villages. In an attempt to prevent the secession of Kosovo and Metohija Serbian government in 1990 abolished Kosovo Albanian authonomy. A failure of Milosevic government to develop true democratic institutions instead and using the police methods to prevent Albanian secession even more increased ethnic Albanian wish to cut of from Serbia. When the KLA rebels began attacks on Serbs in 1998 the Government brought the army and police to put the rebellion down. In the course of the civil war - 1998-1999 which ended by the NATO intervention against Yugoslavia more than 500.000 Kosovo Albanians fled the province to Macedonia and Albania. After the war, despite the international presence, KLA organized persecutions of Serb population and more than 200.000 Serbs fled Kosovo and Metohija. Only 90.000 Serbs remained living in total isolation, dispersed in several KFOR protected Serb enclaves. Rastko electronic library presents dozens of books, texts and studies covering the Serbian history from the earliest periods until our days. The recent events in Kosovo and Bosnia are specially covered. supporters of the Ottoman Moslem rule in the Balkans and gave dozens of pashas and veziers. What means Kosovo and what Metohia? Metohia designates the western part of the today's province of Kosovo. It derives its name from the Greek word (metohion, pl. metohia, meaning - monastery estates. In the Middle Ages all the most important Serb Orthodox Monasteries in the region had their estates in Metohia, especially vineyards near Orahovac. History of Kosovo and Metohija by Prof. Dr. Dusan T. Batakovic -A detailed historical overview of the turbulent history of Kosovo and Metohija region. The text covers six historical periods between the 12th century and our own time. Kosovo in the History of the Serbian People by Veselin Kesich - an essay which explains what is the place of Kosovo in the history of the Serbs and why is it so important for them. Serbian Church in History By Very Reverend Dr. Radomir Popovic A detailed survey of the history of the Serbian Orthodox Church with catalogues of Saints, Archbishops and Patriarchs. Serbian Orthodox Church has played a major role in the of the Serbian people and the Balkans in general. History of Yugoslavia - a concise survey of the history of Yugoslavia. 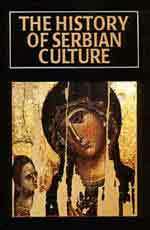 The special focus is on the history of Serbia. History of the Serbs - a text from the CountryWatch.com Site - an overview of the history of the Serbian people. Early Medieval History of Serbia (until 1321) from the Ilustrated History of the Serbs - other chapters are being translated into English - A detailed presentation of the Serbian early medieval history with illustrations. and peaceful coexistence between Christians and Muslims in the Balkans. Two important essays explaining an important link between the history of Kosovo and Metohija, its medieval art and spirituality. This link in its depth contains the innermost treasure of the Serbian national and religious identity. The greatest of these (Serb migrations) took place in 1690, when Serbs rose in support of an Austrian invasion after the Turks' unsuccessful siege of Vienna. However, the subsequent retreat of the Austrians left the native population seriously exposed to Turkish reprisals, and in 1691 Archbishop Arsenije III Crnojevic of Pec led a migration of 30,000-40,000 families from Old Serbia (Kosovo, Metohija and Raska region) and southern Bosnia across the Danube. As a consequence, parts of the Austrian Military Frontier came to contain some of the major centres of Serbian culture. At the same time, the spread of Albanian Muslims into lands left vacant by the great migration was to provide a continuing source of communal tension. It was also the period of intensive islamization when a considerable number of Christians were forced to convert to Islam in order to evade heavy taxation and reprilals. A comprehensive historical study focusing on the origins of the Kosovo problem in history. The author gives a very detailed analysis of the complicated Serb-Albanian relations. Kosovo - Story Behind Story - An article analysing the present Kosovo situation through the prism of centuries old conflict between Christians and Muslims. Kosovo and Metohija - Serb-Albanian Conflict Prof. Dr. Dusan T. Batakovic - Centuries long conflict of two peoples is not only ethnic, but religious, cultural and civilizational conflict. Kosovo Problem in the Western press in the eighties - A collection of newspaper articles which show quite a different approach to Kosovo problem. 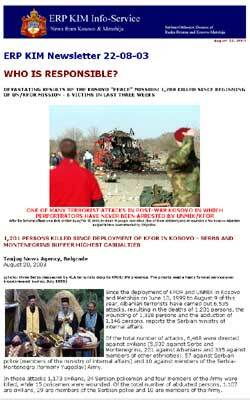 Why Kosovo - The Anatomy of the Needles War by. Bob Allen - An alternative view of a needless war in Kosovo and Metohija. Kosovo Crisis - A text by the Serbian Information Centre in London focusing on the complicated historical circumstance which precceeded the outburst of the conflict. Kosovo Dateline - Kosovo events throughout the history. The Kosovo Legacy, by Thomas Emmert - "One of the main characteristics of Kosovo is the idea of a conscious, willing sacrifice for noble ideals, a sacrifice of one individual for the benefit of the rest, a sacrifice now for the sake of a better future. According to popular understanding which developed in our folk literature, the Battle of Kosovo was not an event in which it was possible to win or lose. It was rather a conscious, heroic sacrifice. A slave is only half a man; a freeman is similar to God." Kosovo and Metohija Under Turkish Rule Dusan T. Batakovic - In our times many historians are trying to idealize so called Pax Ottomana as a period of tolerance and peace. In fact the experience of the Balkan Christian people with Islam is quite different. The new religion of the Arabian prophet only brought discords, suffering, cultural and intellectual deterioration to the entire area. From Pec to Novi Pazar - an extract from the picturesque travelogue by a Russian 19th century traveler Alexander Fyodorovich Gilferding. Gilferding is focusing especially on the position of the second-class Serb Christian population in a priviledged Albanian-Turkish Moslem community. Pec /Albanian and Turkish: Ipek, is quite a big city. It has been estimated that around 4.000 Moslem and 800 Christian families live there. From the latter, a few households belong to the Roman-Catholic church. The Moslems and Catholics are Albanians, and the Orthodox are Serbs. The majority of the Serbs can speak the Albanian language. The Moslems move about armed constantly, while the Christians are forbidden to wear arms in the city. They are usually exposed to various insults and oppressions. The Pec monks go in the bazaar unwillingly during the day time, especially on a bazaar day, and when there are a lot of people. If on those days monks have to go through the city, they avoid crowded streets, and sometimes they take a road round a settlement. Christian women wear white kerchiefs, the same as the Turkish women do. If they didn't do so, they would be exposed to humiliation and insults in the streets. It was really unusual to see a group of ostensibly Turkish women, with kerchiefs on their heads, enter a church and cross themselves. But, the Albanian women in villages do not cover their heads, and they walk bareheaded, like the Moslem women. Through the Land of the Serbs - travelogue by Mary Edith Durham who travelled around Serbia and Montenegro in the beginning of the XXth century. We are presenting two extracts covering her visit to "Old Serbia" - Pec and Decani, with picturesque impressions from the monasteries and contacts with the people. The story of Old Serbia is one of uninterrupted misery. The suffering of the Christian peoples in the Balkans is no new thing. It began with the advent of the Turk, and will continue while he remains. As long ago as 1690 the intolerable lot of the Serbs of Old Serbia induced no less than 37,000 zadrugas (family groups, including uncles and cousins) to migrate to Hungary. The Albanians then spread over the vacated lands, which they have been permitted to harry with impunity ever since. A small unarmed Christian population "regulated" by Albanians is not merely unable to rise, it is unable to cry loudly enough to be heard, and there was no foreign consul to make reports. It was not until the Russians (who with extraordinary diplomatic skill lose no opportunity of winning the love of the Slavs of the Balkans) forced Stcherbina into Mitrovitza in 1902 that any light was shed upon the condition of this hapless land. The Albanians promptly shot him. The Christians regard him as the man that died to save them, and cherish his portrait. Until Stcherbina came they lived in a state of terror, and all that the tax-gatherers spared the Albanians looted. 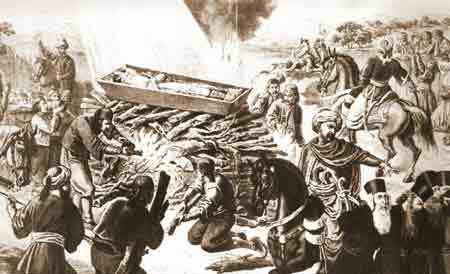 Owing to his death, the Government had sent the Nizams to subdue the Albanians. Pilgrimage to Devic Monastery - another text by Edit Durham with impressions from her visit to the Monastery of Devic during a religious celebration - sabor. Around Kosovo - a text by Mary E. Durham in which she describes the city of Prizren and her travel from Prizren to Gracanica and Mitrovica. Kossovo speaks only of its defeats. It is true that they were nullified by the Serbs of Serbia, who snatched their own liberty from the Turks under the leadership of Karageorge and Milosh Obrenovitch in the early nineteenth century, and pressed on, against the hostility· of the great powers, until they gave liberty to Old Serbia and Macedonia in the Balkan wars. But of this triumph Kossovo says nothing, for the battle which gave it to the Serbs in 1912 was fought not there but at Kumanovo, some miles to the south-east; and even after that it knew defeat again, for here the retreating Serbian Army was bombed by German aeroplanes as they fled towards the Albanian border, and though they pursued their enemies across it when they returned three years later it was without spectacular event. Here is the image of failure, so vast that it fills the eye as failure sometimes fills as individual life, an epoch. The two authors who disliked and criticised each others' work represented the two opposing poles: while West was a Slavophile and a Serb admirer, Durham was a Slavophobic and anti-Serb; while West was inclined to think that lessons can be learnt from the Balkans, Durham stubbornly maintained the air of superiority. 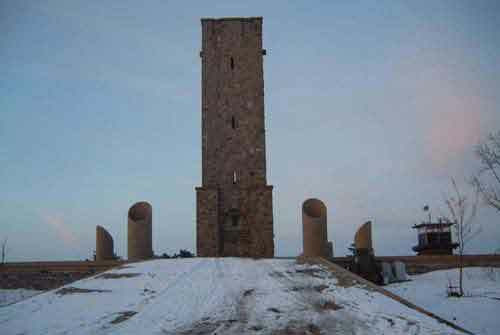 For Durham, the Serbian Byzantine heritage carried negative connotations (since it was usually equated with the Oriental, therefore backward), while for West Byzantine heritage constituted an inseparable part of European culture - the Balkans were precisely the place where this heritage was best preserved, the place where the true reflection of European values was to be found. A critique on the book by M.E. Durham "Through the Land of the Serb"
During the last three centuries Kosovo Albanians managed to change the ethnic composition of Kosovo and Metohija employing different methods of pressure and violence against Serb Christian population. Now, in many areas where the Serbs live no longer their cultural and religious monuments, churches, monasteries and cemeteries, bear witness of thier centuries old presence and achievements. That is why the historiography of this region, and primarily Serb Christian heritage remain the most important targets of the Kosovo Albanian nation-builders and their supporters. Falsifying the history on one hand, Kosovo Albanians continue with systematic eradication of Serb cultural and religious monuments on the other. This has become especially visible now, after the Kosovo war 1998-1999 when under the excuse of "understandable" retaliation they destroy the culture which has survived for centuries. The process of destruction of Serb Christian monuments therefore is not a result of individual actions but enjoys wide spread support of almost all segments of Kosovo Albanian population, especially their political leaders who have done nothing to stop acts of vandalism. Having this in mind it is hardly possible not bo see that this campaign is in many ways organized and intended to change the identity of one entire area in order to present it as purely Albanian. History of the territory of today's Kosovo prior to the rule of Nemanjic Dunasty - an extract from the book by Miranda Vickers "Between the Serb and Albanian"
Every Balkan nation can more or less trace its origins in the Illyrians - but definitely neither of them may claim to have uninterrupted Illyrian continuity. Excessive focusing on the issue of ethnogenesis of one people is usually derailing many historians from the field of science to modern political theories. This specially stands for the Balkans which is known for its dynamic ethnic processes since the times immemorial. It is already in the XV century that the obsession with the Illyrian identity found its way among the Balkan Slavs, especially Croats and Serbs. For some period these peoples were referred in contemporary historical documents as "natio illyrica". Illyrism was one of the basic ideas on which a future Yugoslav idea was born and eventually brought to creation of the common country of Southern Slavs. Albanian Illyrism came as an anachronism in our times and became a crucial element in the formation of the modern Albanian nation in the XIX century. Overstressing of the Illyrian idea among modern ethnic Albanians in the Balkans is a reflection of a process of revitalisation of an essentially national-romantical Albanian programme. This programme is based on the firm conviction that not only all Albanians should live in a Great or Ethnic Albania but should also seek a new political position among the Balkan nations with full "rights" which belong to them as successors of the oldest Balkan population. Modern historical, linguistic and archeological findings are incompatible with a static ethnic theory of uninterrupted continuity of any Balkan nation and rather support a dynamic ethnography according to which there are no ethnically pure groups, especially on such a crossroads of the civilizations such as the Balkans. That is why the Illyrian idea, politicized in the spirit of national romanticism of the XIX century is absurd in our modern times and can only be an obstacle for the Albanian people in establishing normal political relations with the neighbouring countries. Non-Albanian Elements Within the Fabric of Albanian People by Hugo Roth - a scientific approach to a complicated issue of ethnic composition of Albanian people today. "At first we were confused. The East thought that we were West, while the West considered us to be East. Some of us misunderstood our place in the clash of currents, so they cried that we belong to neither side, and others that we belong exlusively to one side or the other. But I tell you, Ireneus, we are doomed by fate to be the East in the West and the West in the East, to acknowledge only heavenly Jerusalem beyond us, and here on earth--no one"
The Spirit of the Serb by R.W. Seton-Watson and Serbia, by R.W. Seton-Watson Two essays by R.W. Seton-Watson a well-known British historian and expert for studies of Middle and Southeastern Europe. In the 4th century BC, invading Celts forced Illyrians from the northern Adriatic coast, and over several centuries a mixed Celtic-Illyrian culture arose. In the 3rd century BC, Rome conquered the Adriatic coast and over the next 500 years, Latin culture permeated the region and the Illyrian, Celtic, and Thracian languages all eventually died out. Slavic tribesmen poured into the Balkans during the fifth and sixth centuries. They allied with the powerful Avars to plunder the Danube Basin. The Avar incursions proved key to the development of Yugoslavia because they immediately preceded, and may have precipitated, the arrival of the Serbs and Croats. The Serbs occupied large parts of the land toward the end of the twelfth century. During the Great War (1683-1690) between Turkey and the Holy Alliance - created with the sponsorship of the Pope - the Serbs rebelled against the Turks. Soon guerrilla war spread throughout the Balkans: from Montenegro to the Danube basin and Ancient Serbia (Macedonia, Raska, Kosovo and Metohija). However, when the Austrians started to pull out of Serbia, they invited the Serbian people to come north with them. Having to choose between Turkish vengeance and living in a Christian state, Serbs massively abandoned their homesteads, lead by their patriarch Arsenije Carnojevic. Many areas in southern Balkans were de-populated in the process, and the Turks used the opportunity to Islamize Raska, Kosovo and Metohija. In retaliation, after the defeat of European forces in 1690, the Ottomans and Muslim Albanians exposed the population to mass reprisals and, essentially, to the first large-scale ethnic cleansing, including in Kosovo and Metohija where some 1 400 Christian monasteries and churches covered the area. In April 1941 the Axis powers occupied Yugoslavia and disintegrated it. The western parts were turned into a Nazi puppet state called the Independent State of Croatia. Kosovo and Metohija were mostly annexed by Albania. Following the Nazi example, the Independent State of Croatia established extermination camps, killing over 750 000 Serbs, Jews and Gypsies. With the eviction of the Serbian and Montenegrin population, Albanians from Albania and Turkey were settled in the region. After the World War II, the communist authorities of that time prohibited the return of the deported Serbs, and in the period 1968-1988 an additional 220 000 Serbs and Montenegrins were deported from over 700 villages. Over 400 000 Serbs and Montenegrins left Kosovo and Metohija during 40 years. In June 1991 both Croatia and Slovenia passed declarations of independence from the Socialist Federation of Yugoslavia. Bosnia and Herzegovina followed in April 1992. Ethnic violence flared almost immediately, with thousands of Serbians being forced from the new independent states. The largely Serbian-led Yugoslav military reacted by pounding the break-away Bosnia and Herzegovina, leading the UN Security Council in May 1992 to impose economic sanctions on the Belgrade government. In 1990, a resurgence of nationalism led the ethnic Albanian majority in Kosovo to demand greater autonomy, but they were rebuffed by Serbia. In 1996 the Kosovo Liberation Army (KLA) begins attacking Serbian policeman. 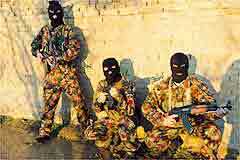 In February 1998 President Slovodan Milosevic sends troops to Kosovo to quash unrest in the province; a guerrilla war breaks out. NATO starts air attacks against Yugoslavia in March 1999. More than half a million Albanians move out of Kosovo. In June 1999 an international protectorate is established in Kosovo and NATO led peacekeeping troops move into the Province after the withdrawal of the Yugoslav forces. More than 200.000 Serbs and non-Albanians flee from the province in front of the wave of KLA led Albanian retaliations. 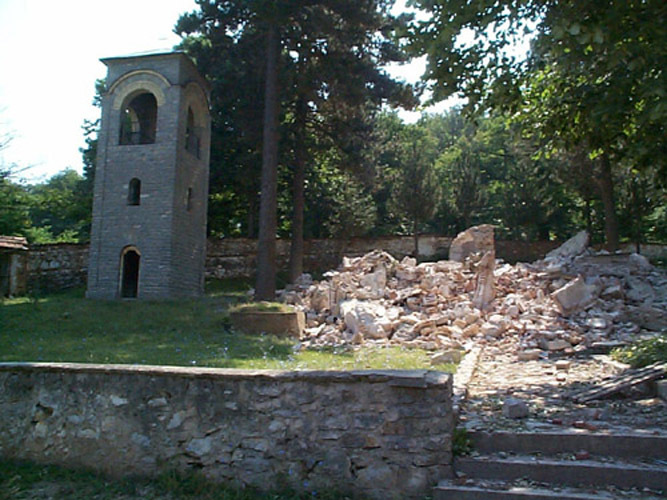 More than 100 Serb Orthodox churches and monasteries were destroyed despite the NATO presence. Despite the international presence Kosovo province remains unstable and volatile region. The Kosovo Chronicles by Dusan Batakovic (1992) /the complete Internet edition/ Book on history and nature of Serbo-Albanian relationship, by famous Balkans historian. Essential reading! The Kosovo Question: Past and Present by Dimitrije Bogdanovic (1985) Summary of a book by renowned Serbian historian, published by Serbian Academy of Sciences and Arts. "Today Kosovo has become a general term denoting a complex problem in which history is being faced with our reality. Two neighbouring Balkan peoples, the Serbs and Albanians, are weighted down with antagonisms which have been accumulating over the past three hundred years. The problem cannot simply be reduced to the legal constitutional status of the Autonomous Province of Kosovo nor to the position of the Yugoslav Albanians. On the contrary, it is far more a question of the survival and position of the entire Serbian nation - in Kosovo, in Yugoslavia, in the Balkans"
Kosovo Origins by Hugo Roth /the complete Internet edition/ A comprehensive historical overview of the Kosovo problem. The goal of this valuable study is to help better understanding of Serb-Albanian relations through the history. Kosovo by William Dorich /the complete Internet edition/ Another valuable historical study of the Kosovo and Metohija history. The author offeres an anthology of texts important for better understanding of the Kosovo problem. The Saga Of Kosovo by Alex Dragnich & Slavko Todorovich /the complete Internet edition/ An elaborated historical analysis of the complicated Serb-Albanian relations during the last several centuries. The book covers the contemporary history until 1984. A rich catalogue of select bibliography. 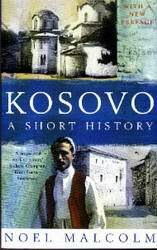 A Short History of Kosovo by Noel Malcolm is usually considered as one of the prime historical sources on the history of the province. In fact this book is an example of the History with a political attitude because it is not by chance that Malcolm who attacks the "myths" of Serbian history is at the same time a president of the Anglo-Albanian Association and one of the strongest supporters of independence of Kosovo. Being far from an objective scientific work Malcolm's History of Kosovo can be better classified as a kind of historical pamphlet which will not easily outlive the present political moment for which it was written. Similarly like his Shorter History of Bosnia, in which he idealizes the Ottoman rule beyond any measure, the Short History of Kosovo will find eager readers only among those who seek instant, black and white histories and do not have much time and intellectual eagerness to delve more deeply into the history of the Balkans. In order to counter-balance the wide-spread pro-Albanian theories disseminated by Noel Malcolm and other biased historians we are presenting a complete internet edition of a book which contains several historical and scientific studies by eminent Serbian historians on Kosovo and its history in relation to certain questions raised by Mr. Malcolm. Scientific Discussion on Noel Malcolm`s book "Kosovo. A Short History"
4. Ema Miljkovic-Bojanic, Malcolm's Apology of the "Pax Ottomana"
ERP KIM Info-Service is the official Information Service of the Serbian Orthodox Diocese of Raska and Prizren and works with the blessing of His Grace Bishop Artemije. 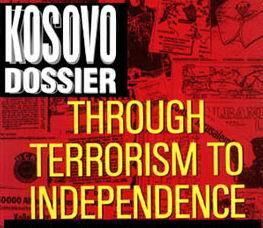 Our Information Service is distributing news on Kosovo related issues. The main focus of the Info-Service is the life of the Serbian Orthodox Church and the Serbian community in the Province of Kosovo and Metohija. In his introduction to this book, Malcolm assumes that many of his readers will have the current crisis in mind when they read a history of Kosovo. At one level, he argues, "a history of Kosovo has to be defined by questions projected back into the past from the political conditions of the late twentieth century." (p. xxxiv) At the same time he suggests that "it is not the purpose of this book to present a case for or against any particular solution to the Kosovo crisis." (p. xxxii) Nevertheless, his arguments and analysis in this volume and his subsequent more popular writings in which he advocates independence for Kosovo make it difficult to accept his disclaimer. There is little doubt that this book was inspired by the growing crisis in Kosovo in the 1990s; and its arguments are clearly driven by the parameters of that crisis. The following text is an excrept from Ibrahim Rugova's press conference on August 25, 1995 in Pristina. In his speech Mr. Rugova gives his view of the history of Kosovo which is a typical example of the modern day Albanian use of misinterpreted history for political purposes. 1. "Kosovo was inhabited by Albanians since ancient times"
WRONG: Albanians as a people which we know today appear as a compact ethnic group only in early Middle Ages and are first mentioned in historical documents in the 11th century. Kosovo and Metoija were inhabited by a majority of Slav population since their arrival to the Balkans until 18th century and their migration under the Ottoman pressure. Kosovo therefore does not have an exclusive Albanian character because the majority of cultural and historical monuments are of the Serbian origin. Albanians are first mentioned in the 11th century under the name of Arber by Byzantine chronicles and their uninterupted link with Illyrians is highly disputable and cannot be proved by modern historical science. Arberia was situated in the central area of today's Albania and until 14th century there are no records of Arber (Arvanite, Albanian) settlers on the territory of Kosovo and Metohija.Therefore, between the 3rd century AD when Illyrians are last time mentioned as a distinct political factor and the appearance of Albanians/Arberians there are no events which prove any link between the two which makes this Illyrian theory more a romanticized myth than a historical fact. Since 18th century Albanians call themselves Shqiptar (Albanian) and their country Shqiperi (Albania). At the same time when these names are used by others Kosovo Albanians consider them derrogative. According to many Serb medieval chronicles and documents one may conclude that the number of Albanians in Kosovo was not exceeding 2% of population which was predominantly Serbian and it is only in the later period that the number of Albanians increased due to migrations in the Ottoman period. In fact, since Slav migrations in the VI and VII century today's region of Kosovo and Metohija had been inhabited by Slav population compared to central regions of Albania (around Kroja) where Slavs never managed to absorb the proto-Albanian ethnic core.Although we do not intend to support a theory according to which Albanians or their ancestors (whoever they were) never lived in the territory of today's Kosovo and Metohija - but only to underline a historical fact, which is also recognized by Malcolm despite his pro-Albanian position. In his book The Short History of Kosovo he abolishes one of the most popular quasi-historical Albanian claim saying: The idea that the great mass of the Kosovo population, behind the cover of their Serbian Orthodox names were albanians, who coninued to speak Albanian is simply not credible. If that were true then the names of most of towns and villages in Kosovo would have been Albanian, whereas in fact the great majority of them are Slav. Albanians have certainsly had a continuous presence in this region. But all the evidence suggests that they were only a minority in Medieval Kosovo" (p. 56-57). 2. Kosovo was always a separate entity throughout the Roman, Byzantine and Ottoman rule. WRONG: Kosovo has never been a separate political or ethnic entity in its history and in its present borders exists since the end of WW2. In fact the province always consisted of Kosovo (central and eastern part) and Metohia (western part) which have different cultural and geographical characteristics. Kosovo has never been a separate entity until our own times, neither in political nor ethnical sense. Beside other periods, Mr. Rugova fails to mention the time between 12- mid 15th cent. of Serbian rule and simply jumps over from Byzantines to Ottomans. In the later Ottoman period there existed Kosovo Vilayet but as an entity which does not correspond to the area where Albanians lived. It was one of many administrative units which did not reflect any homogenous ethnic or political realities. Additionally, Mr. Rugova fails to mention that Kosovo is first mentioned under this name by Serbs, who gave the name to the central plain around Pristina. It had never been mentioned by that name (Kosovo/a) before it finally became a part of Serbian Kingdom in 12th century. Nevertheless, even in that time Kosovo was just a name for a fertile plain stretching from Mitrovica to Pristina and Kacanik, while the western part was called Metohia - (gr. metochia - monastery estates). The present administrative boundaries of Kosovo province were drawn by the communist authorities after the WWII when Kosovo was given a status of authonomy. 3. Monasteries and churches in Kosovo were Albanian and the Serbs occupied them destroying Albanian Catholic churches. WRONG: There are no historical records of any specifical Albanian Roman Catholic church in Kosovo until later Middle Ages. Before today's province became part of Serbian Kingdom there had existed Orthodox Byzantine churches as the entire area had been under the religious and cultural influence of Constantinople, although the Slav language was very often used in church services. In fact until late Middle Ages Roman Catholic religion in Kosovo and Metohija is completely insignificant element beside numerous Serb Orthodox churches and monasteries built by Serb rulers and nobility since 12th century onwards. This is a very popular theory among Albanians who try to find any possible explanation how it happens that "on the ethnic Albanian soil of Kosovo" only Serb Orthodox medieval churches survive until today. This theory is even supported by some western historians like Miranda Vickers although she does not base her presumption on a single concrete example. Noel Malcolm is more cautious and even recognizes that "the first reference s to specific Catholic churches in Kosovo - at Prizren, Trepca, Janjevo and Novo Brdo - come from the middle of Dusan's reign p. 52 SHof Kosovo"(ie second half of the XIV c) In fact problem with this theory of adoption as well as a similar claim that Serb kings imposed Orthodoxy on Catholic Albanian is more a matter of fiction. Before the Serbs included Kosovo within their state this region was under the Byzantine rule and predominantly populated by Slavs of Orthodox faith under the Archdiocese of Ochrid. It is true that some Byzantine cathedrals and churches were enlarged and reconstructed by Serbs, like Bogorodica Ljeviska and Gracanica where Byzantine Orthodox churches had existed before. Existence of any Latin Albanian churches in this area prior the Serb or during the Byzantine rule is not known to the historical science nor can it be proved by any archeological excavation. This, of course does not mean that there were no Roman Cahtolics in the area, but simply that their number and importance was so insignificant to attract any special historical interest. Even Malcolm recognizes that the existing Roman Catholic churches which were built in XIVc were those of Dubrovnik, merchants and Saxon miners and not of any Albanian Catholic population. Suprisingly to many, in the territory of Kosovo there is not a single medieval church (or its remains) which was built specifically by Albanians, not a single fresco or monument bearing any inscription associated to the Albanian ethnicity... simply nothing at all. Also, there are no records at all that Serbs destroyed any Roman Catholic church in Kosovo in the Middle Ages. Old Roman Catholic churches survive there where there was a real influence of Rome in that period, and that is the Albanian coast and the area around Skodra. The sad truth is that Albanian Moslems destroyed many Christian churches and monasteries, just like they are destroying and desecrating them now. 4. There are Albanians of both Catholic and Orthodox confession.... and the Roman city of Ulpiana gave first martyrs. RIGHT...BUT: In Kosovo and Metohija there are no Orthodox Albanians nor any Albanian Orthodox church while the Albanian R.Catholic community does not have continuity with the ancient times. The Christian continuity from the early church up to our own day can be directly traced through numerous Christian monuments (Byzantine and Serb) only within the Orthodox Christian tradition. At the end of his speech Mr. Rugova finally said the truth with an exception that in Kosovo there are no Orthodox Albanians. Christian tradition in the area of Kosovo and Metohija is dominantly Eastern Orthodox and Slav in its character. Ulpiana was an ancient Roman merchant city in which early Christian martyrs Florus and Laurus suffered for Christ. The Orthodox Church glorifies these martyrs and consecrates churches and chapels in their honour. Among Kosovo Albanians there has never been any special cult of these holy martyrs of Ulpiana, especially not among Moslem Albaninas to which Mr. Rugova belongs. It is important to mention that not a single Kosovo Albanian politician, including Mr. Rugova, did anything to stop the destruction of more than 100 churches and monasteries after the war. No one of them has ever visited any monastic community. 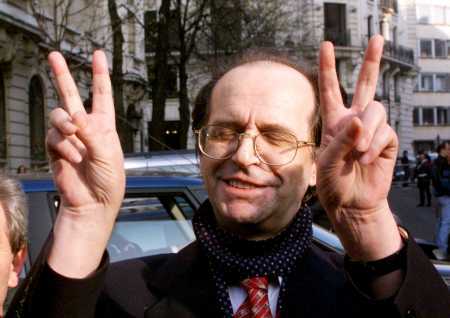 With such a highly unresponsible behavior for a "moderate and democratic oriented politician", Mr. Rugova proved in fact that he did not believe what he had previously said. Because if he or his colleagues had really considered these churches and monasteries to be Albanian, they would have probably be the frist to protect the cultural heritage of Kosovo or at least stop their comaptriots in destruction of centuries long Christian tradition in this region. Ruins of a Serb Orthodox Church of the Holy Virgin Odigitria, Musutiste built in 1315 which among others was classified by Ibrahim Rugova as a Serb political church. The Serbian Church During the Years of Kosovo Hardships - A text by Dimitrije Bogdanovic focusing on the suffering of the Serb Orthodox Church amidst the century long conflict between Serbs and Albanians in Kosovo. The Kosovo Battle was a turning point in the medieval history of Europe. It was not only a battle fought between a Christian alliance led by the Serbian Prince and the army of Sultan Murad but also an event which has marked the centuries of subsequent history of this part of the Balkans. Kosovo has remained an area of conflict between two civilizations, two religions and mentalities. Kosovo-Battle - History and its Importance - Who was St. Prince Lazar and what is the meaning of the Kosovo battle in the Serbian history of Kosovo and Metohija? The Kosovo Field, June 15, 1389 Sima Cirkovic - A historic essay covering the events before, during and after the Kosovo battle in detail. Rises and Falls of the Serbian Statehood in the Middleages - by S. Cirkovic - the author makes an analysis of the turbulet period of the medieval Serbian history. Old Serbia Old Serbia, like expression and terminology, is often founded , not only in science and politics but in an everyday life. Its origin streams from the practice of life and nessecity to make proper demarcation of ethnic entity and cultural-historical existence of Serbs on defined geogarphical area. Borders of that area not so rarely, were detirmened by quite uncenrtain poolitical circumstances, but also other factors as well. It is not determined when the name Old Serbia appeared for the first time, not as far as written sources are consulted,although it is likely that this expression persisted for a long time amoung the people. It is assumed that in verbal Form, it appeared from the times of Great Migration of Serbs 1690 amoung the refugiees in the area of histiric Hungary,where placies inhabited with Serbs are called Serbian Land (Ratzenland, Rassorszag), land of Rachans, Serbs. This originated as a contrast vis-a-vis real, old fatherland from where the migration begun under Patriarchs Arsenije III and Arsenije IV. In the works of Jakov Ignatovic, century and a half after the Great Migration-special emphasis was given to the term of Old fatherlend in Serbia vis -a-vis new one in Hungary, and under the general term of Old Serbia. However real historic meaning of the term Old Serbia was established in the beggining of 19th century after the creation of new Serbian state under Karagjorgje and Milosh, principality of Serbia, in contrast to the unliberated part of the land that used to be medieval Serbia, that remained under turkish rule, up to 1877/1878, and up to its finnal liberation in 1912. In the narrowest sence, Old Serbia was the name of the land of ethnic nucleus and center of the Serbian medieval state of Nemanjich period, the areas of: Old Rashka, Kosovo, Metohija, Morava river and northern Vardar area with Skoplje. In 19th century that territory under the Tturkish goverment with borders on the north and west with free Serbian lands Serbia and Montenegro, and on south and south-east defined with the Borders of Archdiocese of Pech (before 1346), i.e.with the borders of Turkish sanzhak of Skoplje- latter sandzhak of Kosovo with seat in Prishtina and Skopje. Albanian Ethnic Cleansing of Old Serbia by Slavenko Terzic - text on our Site - Historical analysis of the demographic changes in Old Serbia which were a direct consequence of the Albanian expansion and violence on the expense of the Christian Serb population. Greater Albania, by Tim Judah, New York Review of Books - The West had created a monster. Yes, we had severed the head of Greater Serbia only to discover that Balkan nationalism is hydra-headed. In its place we now stood confronted by the evil specter of rabid, expansionist Albanian nationalism, which aimed to create either a Greater Albania or at least a Greater Kosovo.....The prerequisite to creating a Greater Kosovo including parts of Macedonia or a Greater Albania has, of course, to be an independent Kosovo. The Ever-Changing Features of the Kosovo Issue by Thanos Veremis - "Would an independent Kosovo constitute the beginning of stabilisation of the western Balkans and the end of Western worries in the region? Anyone who is remotely aware of the Prizren Declaration of 1878 and the subsequent attempts of the Kosovo Albanians to prevent Montenegro from acquiring its Adriatic outlet and later the march of Albanian forces into Skopje in 1912, will desist from the optimism of considering Kosovar independence the end of history and therefore of irredentism in the region." Kosovo's Forseeable Future Decided, by Tim Judah - "Hashim Thaci, the former political head of the Kosovo Liberation Army, KLA, now the head of the Democratic Party of Kosovo, railed that the constitutional framework "holds hostage the issue of independence". He is absolutely right. The failure of Kosovo Albanian leaders to make a credible stand against violence against Serbs and other minorities, together with the connections between certain circles of the Kosovo Albanian elite and the leaderships of the Albanian insurgencies in the Presevo valley and Macedonia, mean that the foreign diplomats and politicians charged with dealing with Kosovo do not trust its politicians." Kosovo Liberation Army - Freedom Fighters or... A large database of different articles, studies and analyses on the Kosovo Liberation Army, its origins, war and post-war history. The goal of this page is to prove that this is not a genuine movement of freedom fighters but a highly morally corrupted organization which is very dangerous for the regional stability. Despite its official disbandment in Sept 1999 it continues its existence through the Kosovo Protection Corps as well as different sattelite organizations like NLA, UCKPBM, ANA etc, which are responsible for exporting the terrorism to the territory of Southern Serbia and FYROM. Kosovo: Peace Now By Tim Judah, New York Review of Books - But are people like Mr. Thaci suitable candidates for coddling by Western diplomats and politicians? All sorts of charges have been leveled against the KLA. These include accusations that they are drug smugglers and, recently, that they have executed political opponents and dissenters. Certainly the KLA has taken money from the Kosovo Albanian mafia but this does not make the KLA, per se, a drug-smuggling organization. Besides, whatever outsiders may think and say, most Kosovo Albanians see it as their liberation army. The Kosovo and Metohija Problem and the Regional Security in the Balkans by Predrag Simic. The main obstacle to the commencement of a Serb-Albanian dialogue, despite certain encouraging signs, is the overwhelming radicalism of the ethnic Albanians whose political parties are still not ready to give up the idea of an "independent state of Kosovo" and a "Greater Albania" which would have the same consequences for the security of the Balkans and of Europe as would the creation of a "Greater Croatia", a "Greater Serbia" or a "Greater Bulgaria". Historical Institute of the Serbian Academy of Sciences The site with lots of additional links. Fate of the Serbian Cultural Heritage (13-20c) - Milan Ivanovic - A text in which the author is trying to find what happened to Serbian medieval treasuries and libraries in subsequent historical periods. War, Journalism and Propaganda Analysis of Media Coverage in Bosnian and Kosovo wars by Carl K Savich - Truth is one of the first victims in a war. Ethnic Cleansing in Kosovo - A view from the other side by Carl K Savich - Kosovo problem did not begin with Milosevic and it has its deep roots in the Ottoman times when Kosovo Albanians as priviledged Moslem population slowly began to push the Christian Serb population out of their ancestral lands. The Suffering and Martyrdom of the Serbs in Croatia under the Croatian Ustashi fascist regime in WW2. Exibition in the Museum of Holocaust, Washington D.C.
Jasenovac system of death camps - another Site covering the tragic history of Jasenovac death camp.